Make Cucumber Sauce: In a medium bowl, combine yogurt, cucumber, dill,1 tablespoon chopped onion and mint. Cover and refrigerate until ready to serve. Make Burgers: In a large bowl, combine turkey, feta cheese, 1/2 cup chopped onion, oregano, black pepper and salt. Form mixture into 4 burgers. Grill burgers covered 5 minutes on each side, until juices run clear and meat is no longer pink. 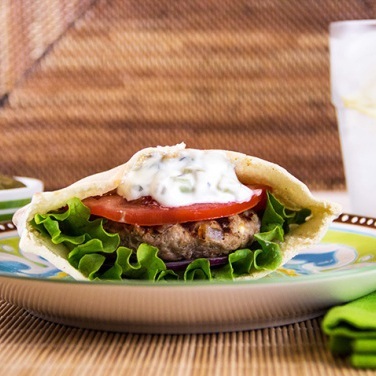 Serve burgers in a pita pocket with Cucumber Sauce, lettuce and sliced tomato.